My set-up was one manual flash speed light, 2 radio triggers and my DSLR. The sky was heavy overcast, and while that great diffused light is perfect for portraits, I needed a bit of an energetic contrasting feel to my pre-visualised shots of Joe. I asked Joe what his favourite moves and roots where at the bike park. The reason being I wanted to capture a true reflection of what Joe does best and not some uncomfortable jump or pose that really was not him. The first jump was this one below, and I was amazed at the height he could go. Because of my photography experience I don’t have to rely on burst mode, I can obtain the shot I want from pushing the shutter once and capturing a single photo of the moment and peak of the jump. It is important to be engaged mentally as when as physically when on a photo shoot, and not relying on the camera to make decisions but you being in fully manual and in total control, meaning the lens, the camera and the flash are on manual. 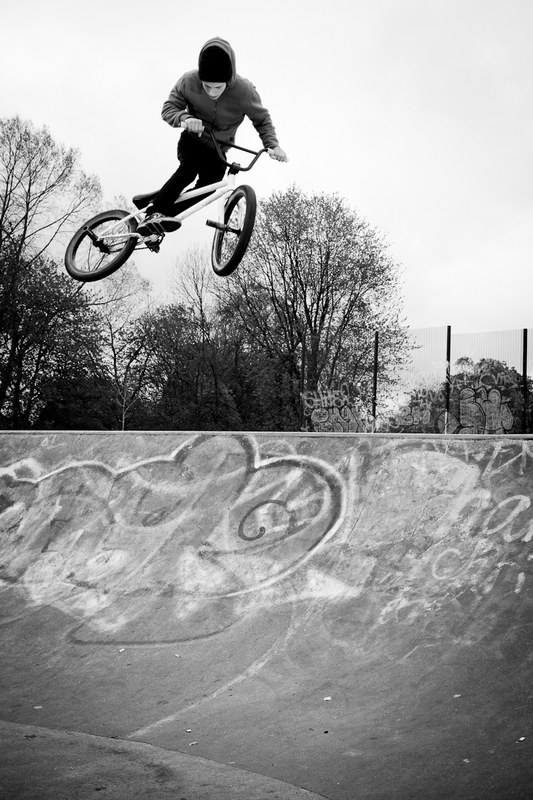 Whilst I love the gritty contrasting black and white urban shots, like the photo above, on the second jump, where Joe went up in the air but spun his handle bars 360 degrees before landing. 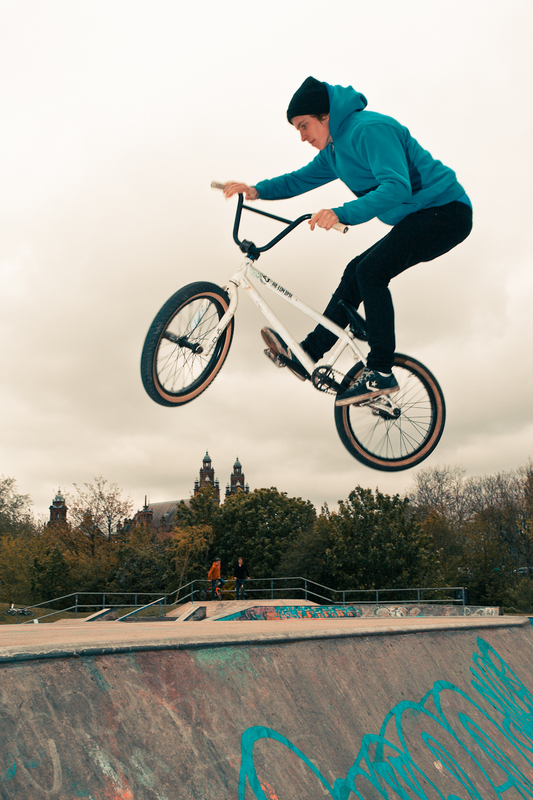 I noticed his hooded top was almost the same colour as the graffiti on the ramp, and so kept this shot in colour, as to emphasise more Joe to his environment. As you can see the off camera flash helped to separate Joe from the dull background, and rightly so, as he was the focus of attention. The flash done exactly what I needed in highlighting Joe’s face and bike, as shown in the photo below. I hope that gives you an idea of what went into the photos. I would also like to thank Joe Manson. If you would photographs of you engaged in your hobby/lifestyle, a photo saying this is who I am and to show the family in the future. Drop me an email (zenowatson@yahoo.com) and we can come to an arrangement. You are currently reading Photo-shoot with Joe Manson at Zeno Watson.